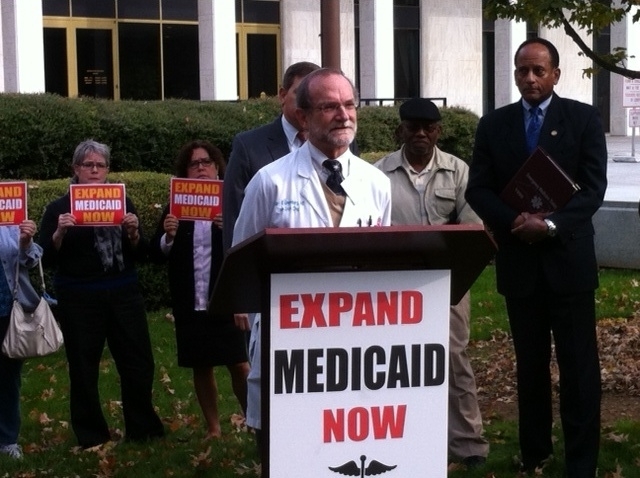 For years now, poor and working North Carolinians who would benefit greatly from Medicaid expansion under the Affordable Care Act have been held hostage as Governor McCrory procrastinated and offered excuses. First, the Guv claimed that the Medicaid system itself was “broken” and in need of repair before it could be expanded. Then, he claimed that it would be inappropriate to act until the U.S. Supreme Court ruled on the constitutionality of the ACA itself. Today, McCrory is running out of excuses. The Supreme Court took care of the constitutionality question a few weeks ago and yesterday, McCrory himself laid Excuse #1 to rest. What’s more, that surplus is more than enough to cover state costs of implementing expansion. As a December 2014 study from health policy wonks at the Milken Institute School of Public Health at George Washington University reported (see page 15), expansion will actually save the state more than $300 million over the next five years. In 2020, however, there will be a modest net cost to the state of $91.7 million. The obvious takeaway? Even if the state flushed away the savings that expansion will bring between now and 2020, it can easily cover the modest bump in costs in 2020 merely by socking away the current surplus. The bottom line: The time for Medicaid expansion and the lifesaving changes it would make for hundreds of thousands of vulnerable human beings in North Carolina is long past due. Dozens of other states with less successful Medicaid programs have already proved this. Unfortunately, as he approaches the final year of his gubernatorial term, Pat McCrory continues to stall, shy away from and just generally flub what could be the single most important and beneficial state policy change in decades. Stand by for more excuses in the days and weeks ahead. 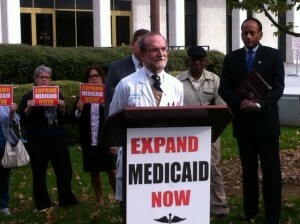 Please expand Medicaid in North Carolina, Gov. Mccrory, I personally know people who are suffering. If you want to hear from some doctors in western part of the state, call the Medical Society of Western North Carolina. They recently made a video that has not been released. You are rich. You can’t imagine the pain. Just a stroke of your pen and many lives would be saved and much human misery avoided. Wouldn’t you feel good about that? If you don’t, I don’t see how you can consider yourself a Christian. Or, it could be put back into the general fund, which is what every agency should do with a surplus. That way the funds can be figured into the next budget and either produce a tax decrease or offset any planned increase in taxes. A much better option than the Medicaid toilet…admittedly a bit better managed toilet than ever before…but still an agency with plenty to prove. NC does not need any additional tax cuts for the “wealthy”. McCrory, the senate and the house have tax cut the Middle class and poor to death. We have homeless women with small children standing on street corners begging for food. Our bridges and roads are crumbling and we have a surplus in Medicaid that should have gone to families in NC that still do no have insurance. I am ashamed of the elected people we have sent to Raleigh. I wonder if we kept the same personal income tax brackets how much better off we would be? By the way, my working family would benefit greatly from Medicaid expansion. We are both educated and I have a very technical graduate certificate in GIS, but we’re still just above the poverty line. I only know that I owed taxes this year on my income in the mid 40s and I have very wealthy friends who are pleased with the tax cuts they are receiving. Pertains, did you owe MORE in actual taxes though? Not just that you may have paid a check to NC due to withholding too little…but that your tax obligation was more. You need to check that out. Also, now that you are in the $40’s you are by default almost rich…at least upper middle class so you do need to pay at least SOME taxes. Go to you D-400 for 2014 and compare to 2013 the tax obligation number to find out…you may be a bit surprised. You also need to adjust for any variance in income year to year as well, so if you were paid a bit more in 2014 you would by default expect to pay a bit more. As far as me…with quite a bit more income between my wife and I as she started work last year, I paid a bit more on an adjusted basis so you have that to go on. But, I did not have to pay the check to NC as I usually do as the withholding was a bit more accurate for me. So we have big news! The ACA is indeed legal and NC Medicaid is not really broken. Of course nothing is perfect, the ACA could be better and our Medicaid could also be better. One way it could all be made better is if the more fortunate among us really did care about the less fortunate and are willing to say so. Until that happens on some major scale what we risk is just more weak excuses from those with the power to actually lead us towards meaningful change that benefits our citizens. Pray for enlightenment, but don’t hold your breath. I do not claim any withholdings which is a good thing with the new “tax cut”/savings that were enacted. In the past I was in the 6 figure bracket and I choose to change directions in my career. I am positive I can determine why I had to pay more in taxes and it was not due to an error on my part but thanks for your CPA tutorial. So you choose to not answer the question so I assume I am correct as you are choosing to dodge it…..regardless of the bracket, you seem to be a bit in the dark.